A puzzle game in which we deal with arranging stained-glass as a background for dials. The production is the work of an independent studio Onyx Lute and is distinguished by a very nice graphic design and relaxing atmosphere. Glass Masquerade is a logic game in which we have to arrange extremely decorative.... clock faces. The game's most distinguishing feature is its very attractive graphic design, inspired by the Art Deco style and the works of 20th-century stained-glass artists. Glass Masquerade is a debut project of Onyx Lute. The gameplay in Glass Masquerade is really simple and reminiscent of arranging puzzles - the player's task is to match the available fragments to the appropriate fields in order to complete a stained-glass window. The game features dozens of different puzzles - we can solve them at our own pace (there is no time limit, although after completing the game we can take up individual challenges again, trying to complete them faster). The aim is simply to have a quiet, relaxing fun. 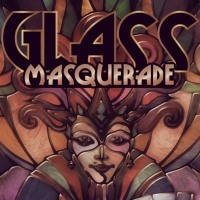 Glass Masquerade offers a single player mode. The creators did not prepare any multiplayer modes. Glass Masquerade graphics are undoubtedly one of the biggest advantages of this production. The graphic design consists of numerous colourful illustrations that resemble stained-glasses. The illustrations feature various motifs, related to different cultures. Each of the works is unique and most of them make a really good impression. The gameplay is accompanied by an atmospheric, calm soundtrack created by the Russian composer Nikita Sevlanev.